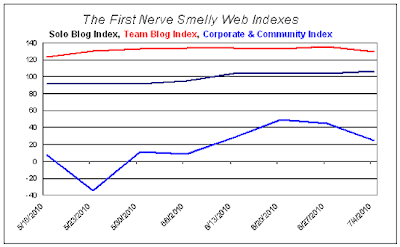 FirstNerve was on the golf course last weekend and no results were posted for June 27; here we summarize Smelly Web Index action for the past two weeks. The Corporate & Community Site Index slipped a bit last week; it plummeted 20 points this week on a 17% down-draft at the TheDryDown. 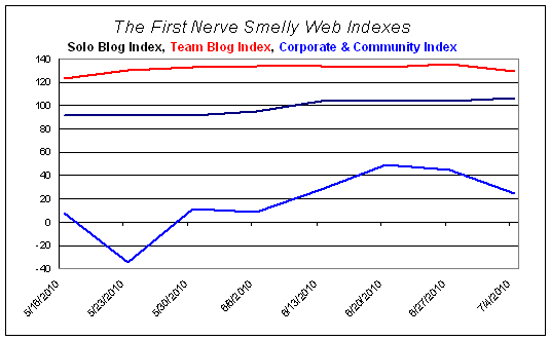 The Team Blog Index hardly budged last week but dived 6 points this week as PerfumeDaRosaNegra wilted 20%. The Solo Blog Index ticked down a point last week; only four of the eighteen sites showed a gain but the losses were generally small. This week the SBI gained 3 points with lots of movement among the component sites. MaisQuePerfume and KatiePuckrikSmells posted notable gains.